There is something alluring, almost mystical, which intertwines the aberration and technical brilliance of some of the greatest forwards to play the sport. George Best, Diego Maradona and Paul Gascoigne are just a few diamonds in the rough who have dazzled the world; their idiosyncrasies, mesmerising technique and controversies on and off the pitch cementing them into football folklore. Luis Suárez looks to be the latest to carry this mantle. 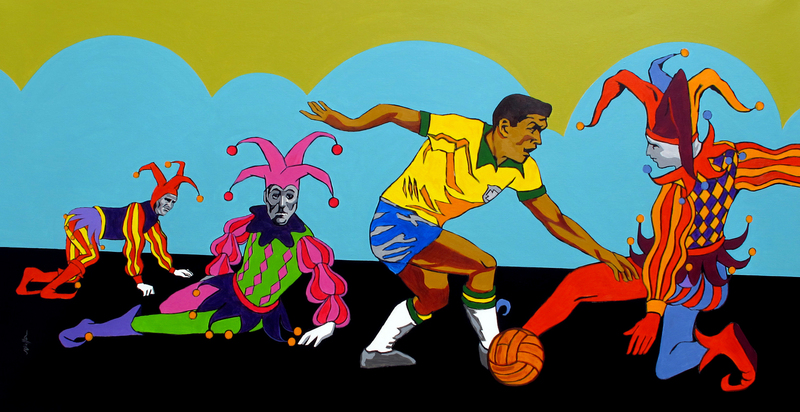 However, before these colourful characters made their mark on the football cosmos, a sprightly young Brazilian winger was arguably more outlandish, more brilliant, than any of the others. Manuel Francisco dos Santos, or ‘Garrincha’, is one of the true Brazilian icons and greatest dribblers in football history, but was another embodiment of genius and madness rolled into one. Like the aforementioned livewires on the pitch, Garrincha was not born with a silver spoon in his mouth. “On what planet was Garrincha born? On a small planet called Pau Grande,” reads Mané’s memorial in the blighted district of Magé, highlighting the Brazilian starlet’s proletariat and humble roots. Born to an alcoholic father, Garrincha played little football off the streets as a youngster, only playing for the local factory in which he plied his trade at the age of 14. It wasn’t just Mané’s underprivileged upbringing which dealt him a bad hand; the Brazilian winger was born with several biological abnormalities. A deformed spine, a right leg that bent outwards and a left leg six centimetres shorter, which curved inwards, Mané was everything but the quintessential footballer. With his swaying walk and dainty frame, the name ‘Garrincha’ and ‘Anjo de Pernas Tortas’ was coined – translating to ‘The Little Bird’ and ‘The Angel with Bent Legs’. Truly unorthodox, Garrincha had few aspirations to play professional football. Despite his physical disadvantages, Mané’s technical ability impressed the local scouts, who eventually persuaded the then-married and parented Brazilian to sign for local club Botafogo in 1953. During his first training session, Mané showed his first sign of cheek and ingenuity to nutmeg Brazilian international Nilton Santos who, as a result, promptly recommended A Seleção to monitor the Brazilian’s career. However, there were concerns about his training ethic and lifestyle, with Mané often drinking a bottle of Cachaça – Brazilian rum – on a daily basis. Garrincha continued to impress, scoring a hat-trick on his reserve team debut, but progress was blocked by the highly-impressive right-winger Juninho. After Juninho departed to Fiorentina – who, incidentally, was later voted as La Viola’s greatest ever player – Garrincha shone in his absence, scoring 20 goals in 26 games for Botafogo and helping them lift the Campeonato Carioca in 1957. Impressing in the domestic league, the young starlet was eventually called up to represent Brazil at the 1958 World Cup in Sweden. Shortly before the tournament, Garrincha scored one of his most renowned goals – against Fiorentina. Dribbling past four players and the goalkeeper, he ignored the open goal and had the audacity to wait for a defender to get back before dribbling past him and scoring. Complete confidence and impetuous skill became a hallmark for the Brazilian, but the national team were disappointed with the irresponsibility he showed. As a result, Garrincha did not play the first two fixtures of the World Cup. However, a crunch-tie with the favourites USSR beckoned, with the winner through to the next round of the tournament and escaping a playoff with England. Garrincha and Pelé started; it heralded the start of a formidable partnership that would never be beaten in international football. Garrincha and Pelé instantly hit it off, playing what was dubbed by Brazilians as “the best three minutes of football of all time” by completely dominating the USSR in the opening moments of the match before winning comfortably 2-0. Brazil went on to win their first ever Wold Cup in 1958, with Garrincha and Pelé in the Best XI of the tournament. Garrincha was at first confused about the celebrations, thinking that Brazil had to play every team in the competition twice like in the traditional league format. Once again, there was madness to the genius. After the highs of Brazil’s first ever trophy, Garrincha, like many other footballers who rapidly elevate to stardom, began to get sucked into the allurement, riches and inveiglement of fame. His vice of drinking began to encapsulate his life resulting in a rapid weight-gain. Unexpected pregnancies and an incident which even resulted in him running over his own father followed. The stocky winger was dropped from the national team as a result, before being called up for the 1962 World Cup in Chile. After Pelé got injured during the second game of the tournament, Garrincha was the team’s sole talisman. Described by the English press as “Stanley Matthews, Tom Finney and a snake charmer all rolled into one”, Garrincha propelled Brazil to a successive World Cup victory, finishing top goalscorer – unheard of for a right-winger at the time – and crowned Player of the Tournament. While Garrincha was the stereotypical bad boy off the pitch, he was the golden boy on it. At the age of 32, the Pau Grande-born star was haunted with a constant knee injury, which troubled him for the majority of his career, and was severely lacking match-fitness. As a result, he played a bit-part role during the 1966 World Cup, notably the 3-1 loss to Hungary at Goodison Park – his last international match and his only defeat for A Seleção. Botafogo, after 12 years, grew tired of the antics which came with Mané and sold him to Corinthians in the same year. Despite a rapid decline, Garrincha carried on playing professional football until he became a grandfather at the age of 40; the Brazilian thought it would be bizarre to have grandchildren while still playing football. After having an estimated 14 children, developing alcoholism and finding himself in severe marital and financial problems, Garrincha’s health rapidly declined. In 1982, he was hospitalised eight times due to alcohol and psychological problems. In 1983, Garrincha died in an alcoholic coma due to cirrhosis of the liver at the age of 49. Despite a melancholy end to an illustrious career, Garrincha is still one of the most respected and revered footballers to ever grace the sport. The man was a complete footballer; he possessed rapid acceleration, breathtaking dribbling ability, had incredible technique with either foot and had a fierce shot and free-kick in his locker. His style was unlike the conventional winger at the time who hugged the touchline – he was analogous to the ‘inside-forward’ which is commonplace today. It was this unpredictable and multidimensional play which caused so much havoc during his career. Off the pitch Mané himself may have been a figure of depression and insanity, but to the people of Brazil he is a manifestation of fun, conviviality and hope. He embodied the Brazilian way with his stunning skills and attractive play, and was the archetypal class-clown of Brazil’s most heralded footballing dynasty. 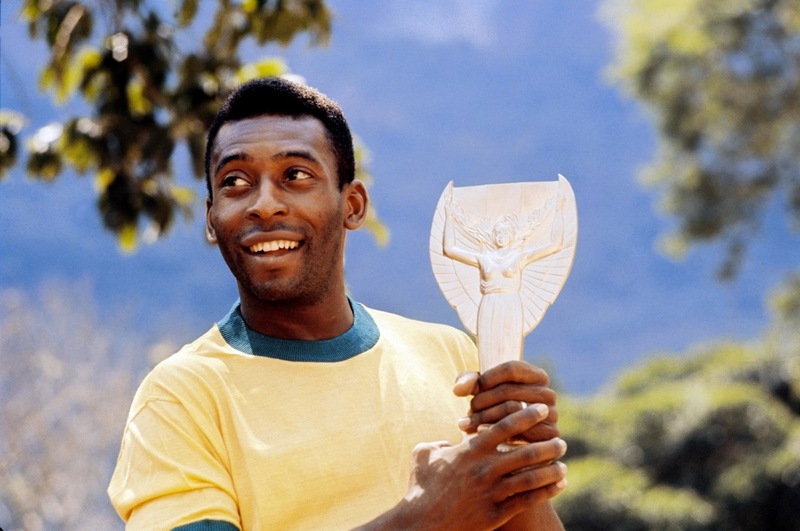 While Pelé is renowned as the greatest Brazilian to play the sport by the world, most Brazilians would find it sacrilege to not mention Garrincha in the same sentence. Had Garrincha not had troubles with alcohol and other demons which come with fame, his career at the top-level may have been prolonged. However, it was maybe this human element, this chink in the armour, of someone who was described as “from another planet” by the media, which identified himself with the nation by such a degree.